It's an island I crossed a thousand times driving into San Francisco but never set foot on until today. 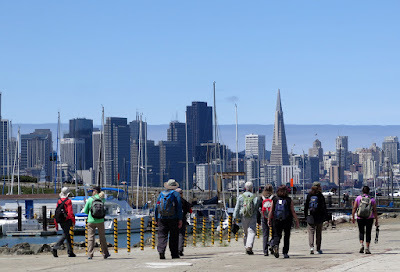 Yerba Buena Island and adjacent Treasure Island were the destinations for the July day hike of the Sacramento County Hikers. Located literally in the middle of SF Bay, these two island's history is as colorful and fascinating as any of the communities in the Bay Area. Briefly, Treasure Island is an artificial island connected by a small isthmus to Yerba Buena Island. It was created in 1936-'37 for the 1939-'40 Golden Gate International Exposition of fill from the bay. Treasure Island was planned and used as an airport for the Pan American Airline's Pacific Rim service of the famed China Clippers flying boats. After the 1939-40' World's Fair, the Navy offered to exchange Mills Field on the SF Peninsula near Millbrae for the island. The City/Co. of SF accepted the land swap. During WWII, the island became part of the Treasure Island Naval Base and served largely as an electronics and radio communications school and major departure point for the soldiers leaving for the Pacific campaign. In 1996, Treasure Island was decommissioned and opened to the general public and the property reverted back to the ownership of the City/Co. of SF. In the 1990's and 2000's, Treasure Island old aircraft hangers served as sound stages and used in film and television productions. Some notable films include Matrix, Indiana Jones and Lost Crusade, Flubber and Patch Adams. In 2005, the City/Co. of SF entered into a contract with a major development company to redevelop and transform the islands into a self-sustaining city. The master plan calls for a mix of low-rise and high-rise towers consisting of 8,000 residential units, a mix of commercial, office and hotel uses, a new ferry terminal, organic farm, wind farm, and 300 acres of parkland. The master plan is designed to be as car independent as possible.